Envenoming can also be caused by having venom sprayed into the eyes by certain species of snakes that have the ability to spit venom as a defence measure. Although there are currently more than 3000 species of snakes in the world, approximately 250 of these are listed by WHO as being of medical importance because of the harm their venoms can do. Medically important venomous snakes can be found in 160 countries worldwide, and snakebite envenoming is a particularly important public health problem in rural areas of tropical and sub-tropical countries situated in Africa, the Middle-East, Asia, Oceania and Latin America. In these regions the risk of snakebite is a daily concern, especially for rural and peri-urban communities where hundreds of millions of people depend on agriculture or subsistence hunting and gathering in order to survive. Rural cropping and livestock workers, hunter/gathers and their children are among the most affected. Children often suffer more severe effects than adults because of their smaller body mass. Lack of footwear contributes significantly to the risk of snakebite for both adults and children. The World Health Organization (WHO) estimates that about 5 million snakebites occur each year, resulting in up to 2.7 million envenomings. Published reports suggest that between 81,000 and 138,000 deaths occur each year. 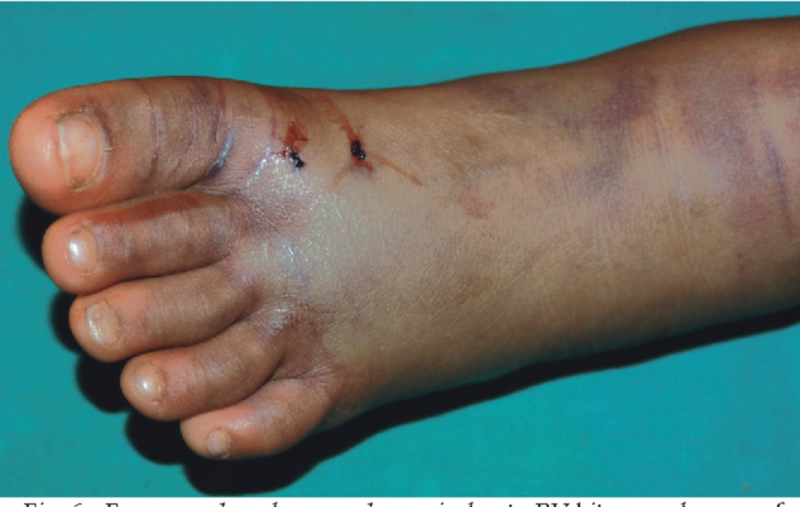 Snakebite envenoming causes as many as 400,000 amputations and other permanent disabilities. Many snakebites go unreported, often because victims seek treatment from non-medical sources or do not have access to health care. As a result it is believed that many cases of snakebite go unreported. Snake antivenoms are effective treatments to prevent or reverse most of the harmful effects of snakebite envenoming. They are included in the WHO Essential Medicines List and should be part of any primary health-care package where snake bites occur. Unfortunately many people either lack access to antivenom, or cannot afford to pay for them. Many families sell possessions or go into debt in order to obtain antivenom after someone is bitten. Difficulties in ensuring proper regulation and testing of antivenoms also affect the availability of good quality, effective products. Following WHO, AHO added snakebite envenoming to its priority list of neglected tropical diseases (NTDs) in June 2017. Efforts are being focused to develop a road map for effective control through programmatic components that address multiple aspects of snakebite envenoming and its impact. Venomous snakes can sometimes bite without injecting venom. This is called a “dry bite”, and it causes mild pain from the snake’s teeth puncturing the skin as well as anxiety. Phone emergency to ask for an ambulance if someone is bitten by a venomous snake and faints or develops symptoms of anaphylaxis.